Do you know what these 3 rooms have in common﻿, besides being pretty? They are my wedding colors! Royal blue & Orange with accents of gold. I feel like I'm living, breathing, eating these three colors lately, hope I don't get sick of them! oh how exciting - i can't wait to see ur weddings pics - the big day is gonna be amazing!! bride brain. love it. did you go get that elephant from HG? that's a beautiful combo, and with some many choices! its going to be gorgeous! I just adore that first room. Wow! It is nice to have inspirational images for your wedding colors! Gorgeous combination. I really love that pop of orange! You must be so excited! don't you love when the obsession sets in? I love these colors. you are going to have a gorgeous wedding!! 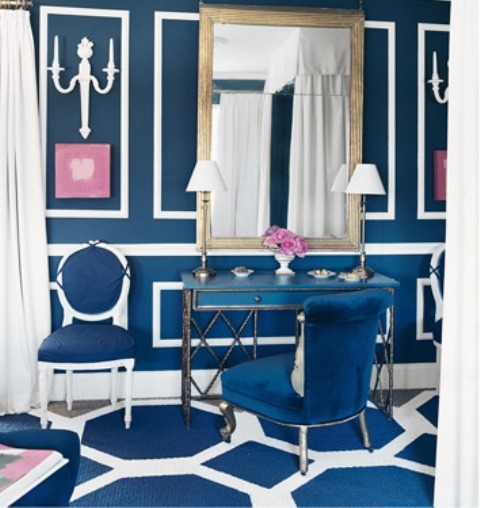 I'm dying for the blue and white carpet in that first room. Any ideas where it came from? Love these colors!! It's going to look amazing!! so pretty & so YOU!!!! haope your halloween was amazing!! !